You've probably passed coin-operated toy machines—those glass-fronted capsule machines that dispense fake tattoos, gooey hands, bouncy balls, and the like—a thousand times without giving much thought to who operates them, or how much money they make. “My Homie Sells Homies,” a stylish new short documentary from Vice magazine’s “Profiles By Vice” series, makes a compelling argument for the drama and pathos that lurks behind the colorful, plastic facades. The subject of the profile is Bradley Ellison, a.k.a. “Sugarman,” a foul-mouthed, Social Distortion-loving packrat who once owned more than 1,500 capsule machines in the New York area. 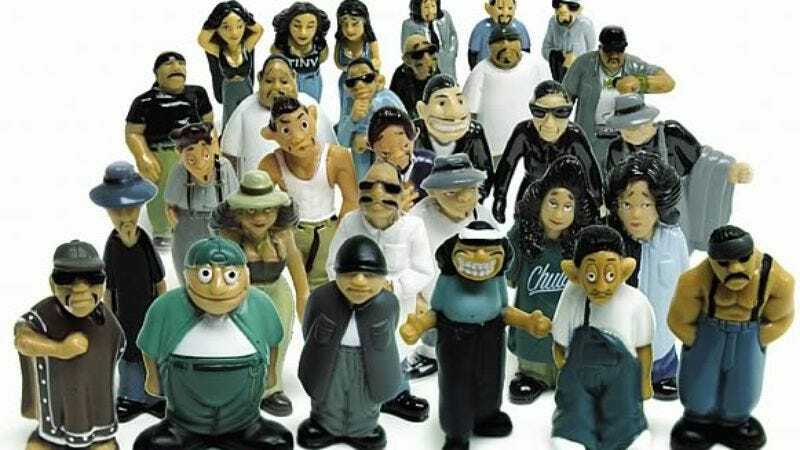 Ellison hit his peak a few years ago, bringing in more than a million dollars in quarters, when he began stocking his machines with the popular Homies series of collectible figurines. Since then, his business has declined, although Ellison does his best to hold on to past glories. The profile tracks Sugarman throughout his day, navigating his hoarder’s paradise of a home, dodging creditors, and prowling the streets of Staten Island, trying to remember which pizzerias and grocery stores still have machines that he can tap to try to fill his plastic collection buckets and pay off his phone bill. The short serves the double purpose of elucidating a weird, niche market that’s been a tertiary part of so many of our lives and of painting a picture of a man who came close to true success once and is still grasping with all his charm and energy for the brass ring.